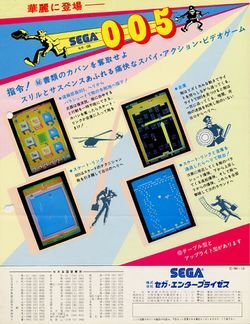 005 (pronounced Double-o-five) is an arcade game that was released by Sega in 1981, and licensed to Gremlin Industries for US manufacture and distribution; it runs upon Sega's G80 Raster hardware, and its name derives from the fact that it is a parody of the James Bond films that have been running since 1962. The player must use a 4-way joystick to take control of the eponymous Agent 005, who's on a mission to deliver secret briefcases to an awaiting helicopter - but he's being pursued by enemy guards, who will stop at nothing to catch him out. The gameplay starts out in the city's streets as 005 parachutes down to the ground; he can either directly run for the helicopter (but the guards will make this quite difficult to do), or duck into one of the six buildings with arrows on their entrances. Three of these buildings are ice rinks (with the ice skate on their roofs), while the other three are warehouses, (with the forklift truck on their roofs) - and some also have gas canisters at their entrances which will extend the range of 005's stun gun (which is activated by a button and will temporarily knock out the guards). In the ice rinks, 005 can lure the guards onto the ice, in order to stun them; but although he can change direction, he cannot stop until he reaches the edge of the ice. While in the warehouses, 005 must walk around crates - but he must avoid getting caught in the beams of the guards' torches as they will begin to chase after him. Once he has reached the helicopter in either case he will have completed a delivery, as the screen cuts back to him parachuting down with another briefcase; if he entered an ice rink before there will now only be warehouses (and if he entered a warehouse, there will only be ice rinks). Once 005 completes two deliveries, he will board the helicopter as an enemy chopper begins pursuing him - which he'll have to shoot down, while avoiding greenery and bombs. Once he's fired enough shots at the enemy chopper to bring it down, the game will start over again. This page was last edited on 10 January 2014, at 17:00.